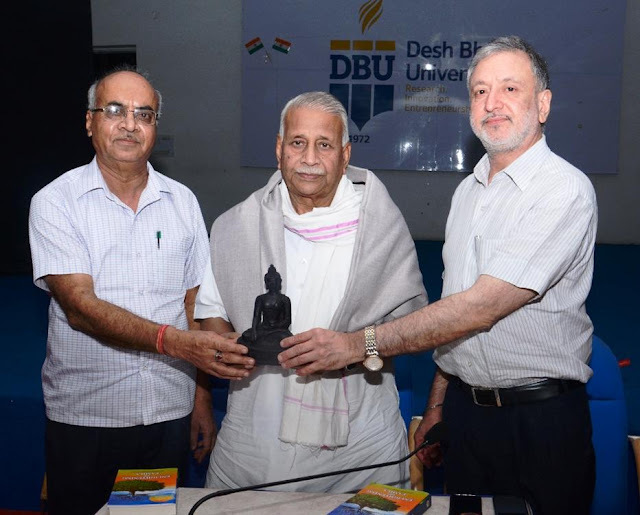 An inspirational guest lecture was organised at Desh Bhagat University on ‘Peace and Harmony in Family’. Large number of teaching and non-teaching staff from different faculties attended it. Mr. Prem Chand Goyal, a senior Parcharak, RSS and Social Worker was the key-note speaker on this occasion. He delivered valuable thoughts about Indian traditions, values and moral character. Vice chancellor Dr. Virinder Singh welcomed the learned speaker and said that he is an ideal person, who has devoted his whole life to propagate Indian values. While addressing the faculty and staff members, Mr. Goyal said that we are searching for peace here and there but it stays within us. The fastest way to achieve peace and harmony is to change your thinking. When you change your thought process, you change your life. He insisted to adopt positive attitude in all fields of life. He said that Indian Family Traditions are one of the best systems in the world. All our religious rituals has scientific logic and these are founded by our Saints and Sages after long practices. But unfortunately, nowadays we are negitively influenced by western culture and this is damaging our rich heritage and culture. We have to stop all this and must make our new generation aware about our own glorious traditions. He advocated that all family members to pray and have meal collectively at least once a week, it will definitely yield positive results. He also firmly inspired the audience to practice yoga, become vegetarian and follow Indian spirit. The staff members evinced a keen interest in the lecture and they asked relevant questions on different topics which the learned speaker answered to their entire satisfaction. University Chancellor Dr. Zora Singh and Pro Chancellor Ms. Tajinder Kaur expressed their happiness and thanked the learned speaker for sharing his valueable thoughts. They hoped that the lecture will prove quite useful for the staff and faculty members.